We’re not talking pre-nuptial agreements – we’re talking about how connected people are to the work they are doing on behalf of their organization. 17% actively disengaged – these people actively prevent effective work from occurring, from quietly dragging their heels to actual sabotage. In other words, if our country was a 100-person organization, and each actively disengaged person “cancelled out” an engaged person, there would only be 12 people pulling the entire 100 people in a forward direction. Gallup estimated the collective annual cost of this disengagement to our economy to be between $292 Billion and $355 Billion. Ouch. Of course obedience isn’t worthless – clearly we need to have people doing things the way the organization needs them done. However, in today’s organizations, obedience makes an insignificant contribution compared to the other capabilities on the list. 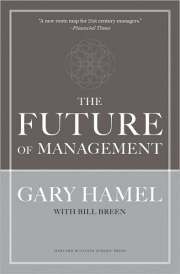 Gary’s main point is that, unfortunately, most organizations aim their management systems toward the bottom two items on the list – which puts their expectations of their people at about the same level as a cocker spaniel. You may think that your management system is different. Could be. But first, ask yourself a simple question – how quickly would NOT doing each item on this list get employees into trouble? Many companies say they want creative risk-taking, yet punish any failures. Many companies say they want passionate employees, yet don’t allow people to change positions when they find that their passion lies in another part of the company. One way to increase engagement is to enable people’s initiative, support their creativity, and help them connect their passion with their work. In other words, help them move up higher on Gary’s list. The good news is that every single person you help move towards engagement makes a tremendous difference to the organization. In our fictional 100-person group above, 1 single person becoming less disengaged would result in an almost 10% increase in productivity for the entire organization. A while back I was speaking with Chad McWhinney about his company. He walked me through how he sees the power of an organization as a ratio of engaged people to disengaged. For example, if 50 people are engaged and 50 disengaged the ratio would be 50/50 or 1. If we got 25 more people engaged we jump up to 75/25 or 3. Five more people raises the ratio of engaged to disengaged up to 4, and so on. Chad’s goal is to get every single person fully engaged and achieve a ratio of 100/0, which would be infinity. So the next time you see the McWhinney logo, you’ll know why it looks the way it does. Do a quick audit of the management system in your organization. What is the management system achieving? One way to do this is to imagine yourself as a space alien who could only understand actions. Through actions alone, what would you discern was most important to this organization? Share your thoughts with your team. Move people up. What’s one small thing you could do to encourage people to use the next highest capability on Gary’s list? Try to go beyond a suggestion box or employee-of-the-month parking space and think about how you can inspire passion and creativity within each person in the organization.